Jackfruit, a large evergreen fruit tree native to India, is known to produce the largest fruit in the world! The outer part of the Jackfruit is hard and textured. The fruit has an outer rind composed of composite pieces that attach to fleshy yellow fruit pulp that have a pulled-pork like texture. When ripe and unopened, Jackfruit can smell slightly unpleasant, but when opened it smells and tastes like pineapple bubble gum! On average, a Jackfruit weighs about 35 pounds but in it's native climate have reportedly been found to weigh over 100 pounds! Not only does Jackfruit have an incredibly unique look and flavor, but it is also a rich source of vitamin, minerals, phytonutrients, carbohydrate, electrolytes, fiber, fat and protein. It contains calories but no cholesterol or saturated fats. Due to it's texture it is often used as a vegan replacement for pulled pork sandwiches. Extra fruit can be frozen for healthy smoothies or made into a variety of products, sauces, or even chips! Artocarpus heterophyllus is the scientific name for the Jackfruit, a member of the fig family of plants and a relative to the Mulberry. 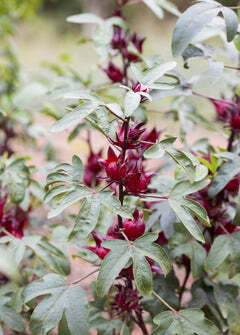 It is native to the southwest portion of the Indian subcontinent and is the national fruit of Bangladesh and Sri Lanka. Jackfruit grows primarily in tropical lowland climates and can bear upwards of 100-200 fruit a year at maturity! Exposure: Full Sun. Jackfruit trees like humid, tropical conditions and are very sensitive to drought and frost.